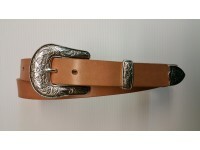 All of our Ladies Belts are top grade, thick (9 to 10 oz.) North American shoulder leather just like the Mens, only prettier, and we offer the same 5-year warranty against breakage. Belts are available in many widths. A standard buckle is included with our belts, but are removeable to accomadate any buckle you want. This belt has a ROSE Stamped in every 6" around the belt, Shown in Dark Brown. As most of our belts .. This Belt has a HEART design every 6" around, and is shown in 1 1/2" British Tan. You choo.. If you want to be noticed, this is the belt for you. Perfect for Men or Women and bordered by a stro..
A wonderfully popular belt for men and women, this design, shown as 1-1/2" Dark Brown, is bordered&n..